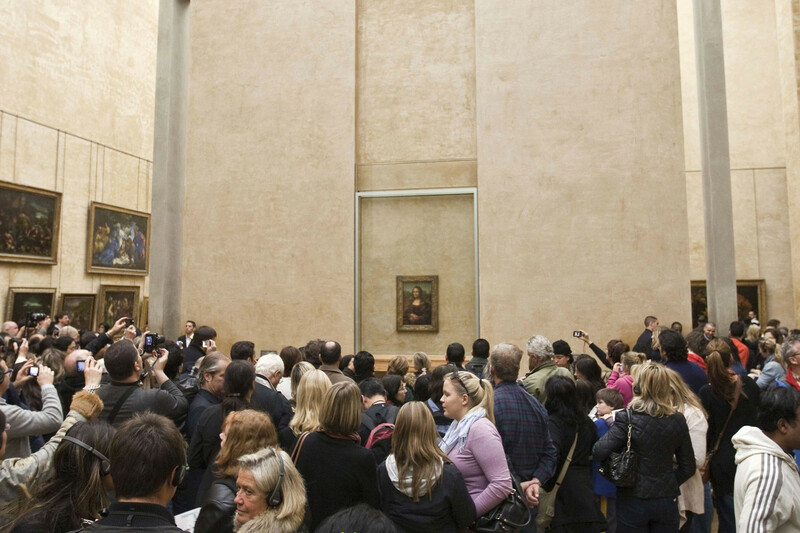 The photo above, from a recent article in The Wall Street Journal, shows hordes of tourists crowding around the Mona Lisa in the Louvre. Been there, done that. Actually, I’ve been lucky enough to visit when I could get up close to the most famous painting in the world without being jostled or impaled by someone’s selfie stick. But that was some years ago, and the enigmatic lady is behind glass anyway. I’d rather look at her in a book. On more recent visits to the Louvre, I’ve escaped her overcrowded gallery as fast as possible. There are plenty of less popular treasures in the Louvre. Right now, it’s much worse: wall-to-wall people, shuffling along shoulder to shoulder. It would be impossible to see and appreciate the grandeur. 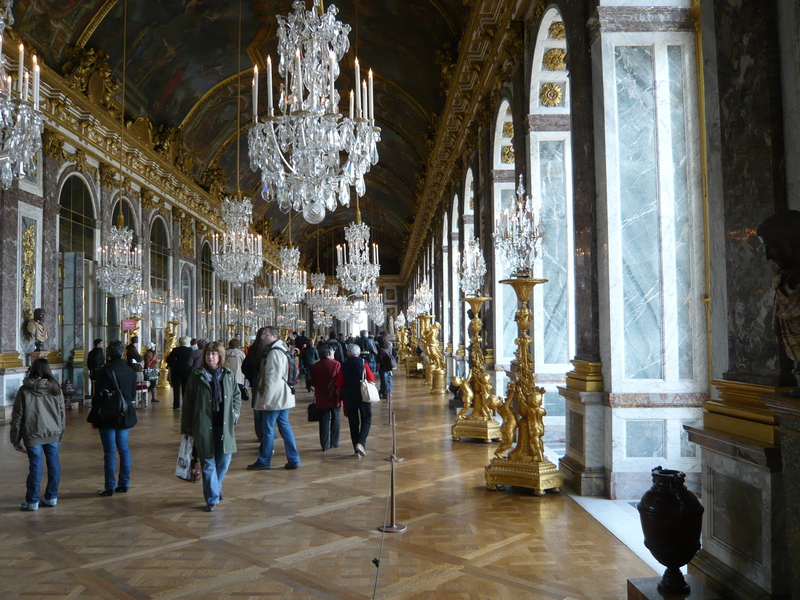 I wouldn’t go near Versailles or any of the major tourist “must-sees” in the height of the coming tourist season. Here’s what I would do instead: forget the major tourist draws, even for people who have never seen them. They’re all in books and movies and videos. Get lost instead. 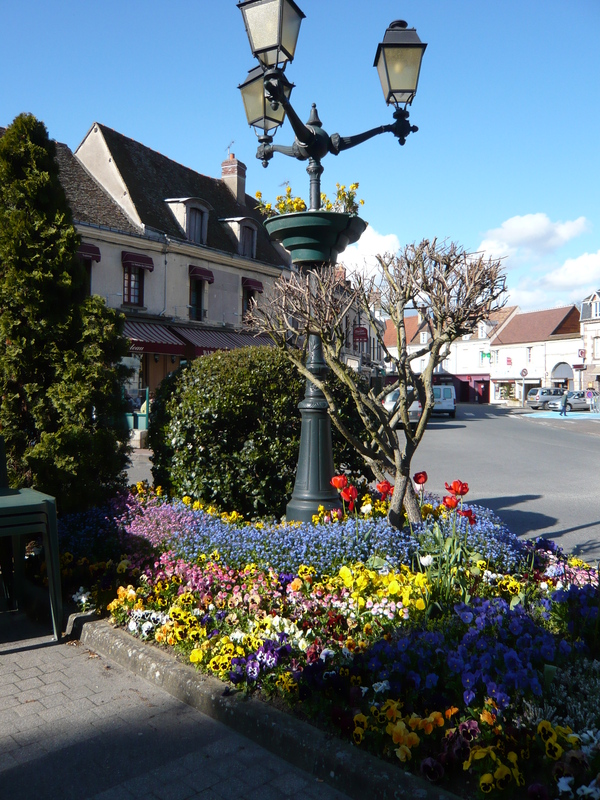 Just a short drive outside of Versailles, the countryside opens into vast serene fields, dotted with farms and pretty towns. It’s easy to get lost with a car and an intrepid driver–preferably equipped with some kind of GPS device when it’s time to get un-lost. But it would work with a railpass and a pair of good walking shoes too. 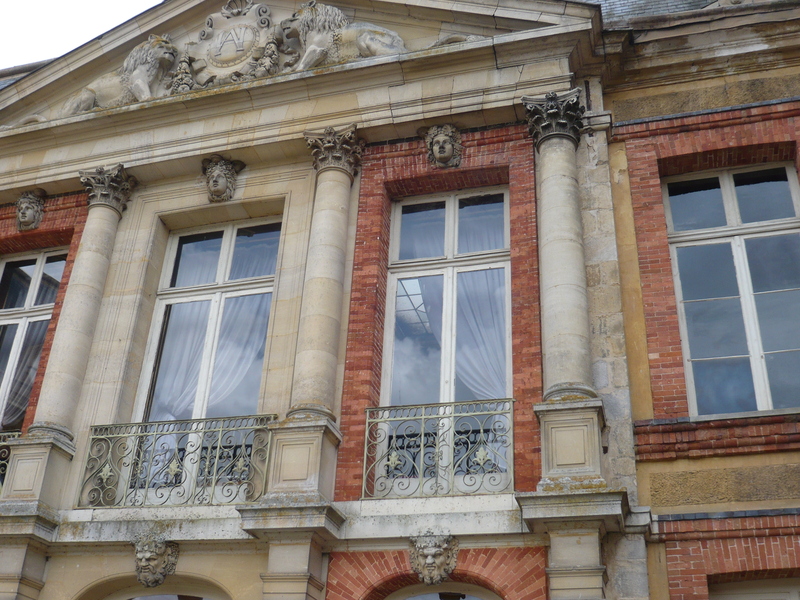 On a trip through the Loire Valley, I came upon a chateau I had never read about in any of my guidebooks. I walked up its paved driveway, admiring the symmetrical beauty of the facade. 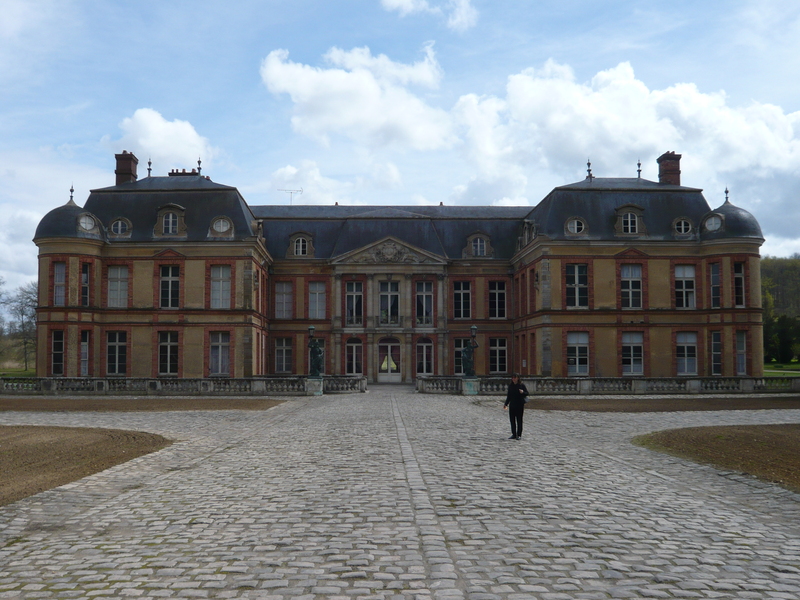 Although I managed to take a tour of this chateau, I can’t tell you its name. My husband and I had the entire place almost to ourselves. What lives played out behind these elegant windows? 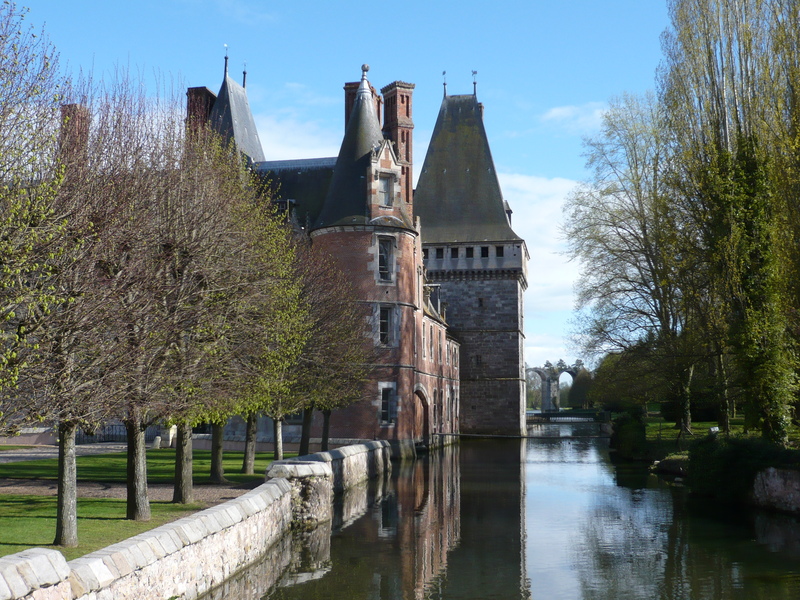 Who strolled in the gardens beside the dreamy moat? No one seemed to be around. We walked around the little gatehouse until a lady appeared, wiping her hands on her apron. She’d been making lunch and not expecting visitors. She made a phone call, and eventually another lady appeared in the courtyard to give us a guided tour. Three other people appeared for the tour. In we went. Instead of the burnished surfaces of Versailles, we were looking at genteel faded elegance: dusty mantelpieces, faded floral wallpaper peeling in places, slightly tattered lace curtains covering ancient wavy glass windows. Alas, the tour was only in French. Still, the tour guide made valiant attempts to explain the history of the family. 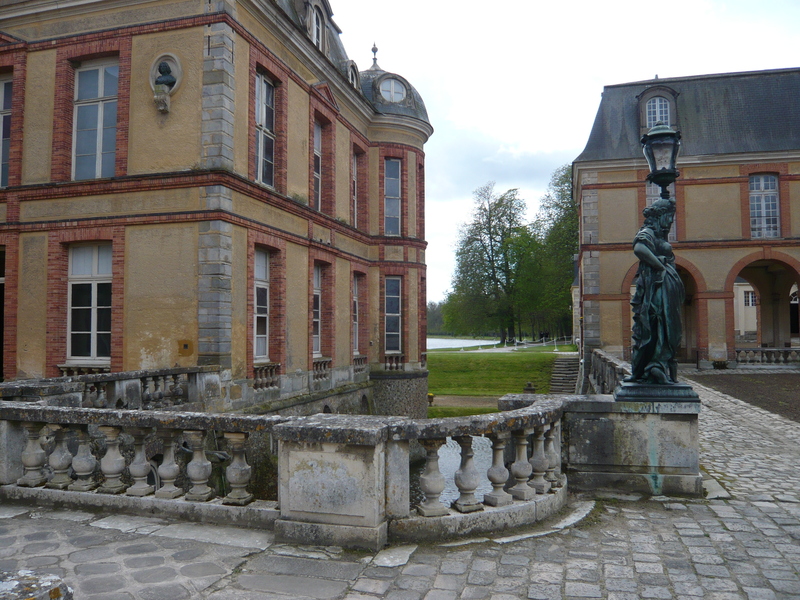 My French was just adequate to understand the most surprising fact: during the turmoil of the French Revolution, the chateau was occupied by an elderly noblewoman who was never once disturbed by what was going on just a few miles away at Versailles. The King and Queen were arrested and hauled off to imprisonment and eventual execution in Paris. All over France, nobles lost their lands–and in Paris, hundreds of them lost their heads. Churches became Temples of Reason. Chateaux were sacked and burned. But at this particular chateau, life went on as before. No doubt there were many anxious days and nights, but the local residents loved this woman and her family. Never once did an angry mob try to cross her moat, which was never built for defense in the first place. The old lady lived out her days in peace, no doubt doing good works among the local peasants. Generally I buy a little guidebook, but there didn’t seem to be one to buy. The name of the chateau? The name of the family that once lived there? In one ear and out the other. We were given laminated information sheets which we had to return. No photos were allowed inside, so I didn’t even think to snap a photo of the information. Now, I’d like to know the name of this chateau and the history of the family who built it. Maybe a reader can enlighten me. The nearby village is substantial enough to have a nice little park. There’s even a City Hall. 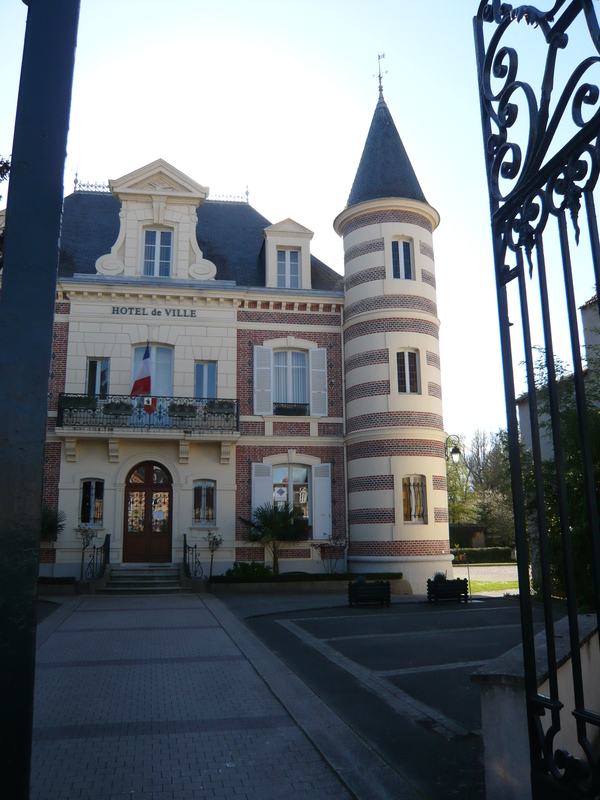 It looks just like hundreds of other city halls in small towns in France. OK, I’ve learned my lesson. Now I fill up my camera with pictures of signs–towns, sights, works of art. It’s nice to know where I’ve been. Still, I have a memory of an unforgettable sight that I took in without mobs of other people breathing down my neck. I had a chance to muse about the actual life of the lone noblewoman who lived out her days in peace and tranquility during the darkest days of the French Revolution. I’ve been fortunate enough to see Versailles already. Even if I hadn’t, I wouldn’t trade a hectic day-long visit to Versailles for my two peaceful and intriguing hours at my Mystery Chateau. Update: May 6, 2018. 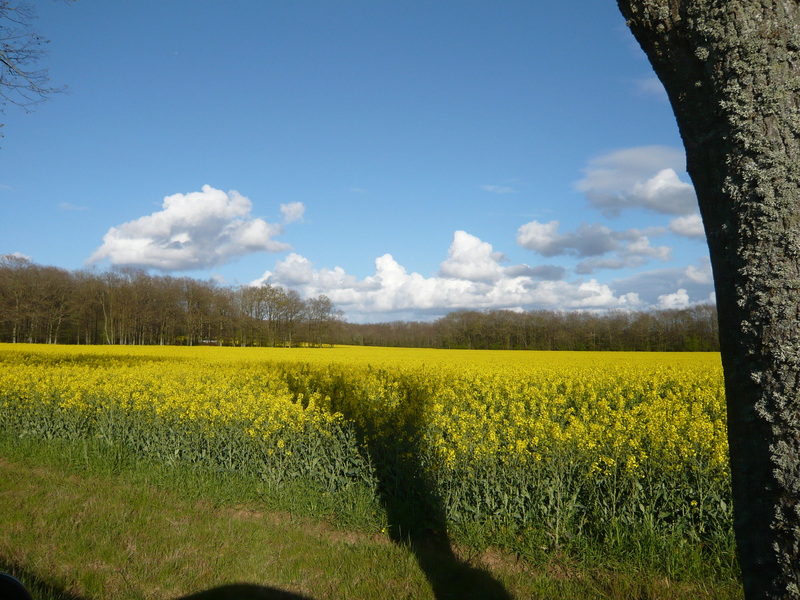 I just returned from a trip to the Loire Valley where I went to a lot of chateaux. I did not get a chance to find my Mystery Chateau, but I think it is Dampierre. I think it is fairly close to Versailles, not in the Loire Valley. I stopped briefly at Versailles and decided I’d like to go back there again in the winter, when there would not be near as many visitors. Maybe I’ll get to look up my Mystery Chateau too. It’s almost always worth going back to sights I’ve already seen. There’s always more to see and learn. 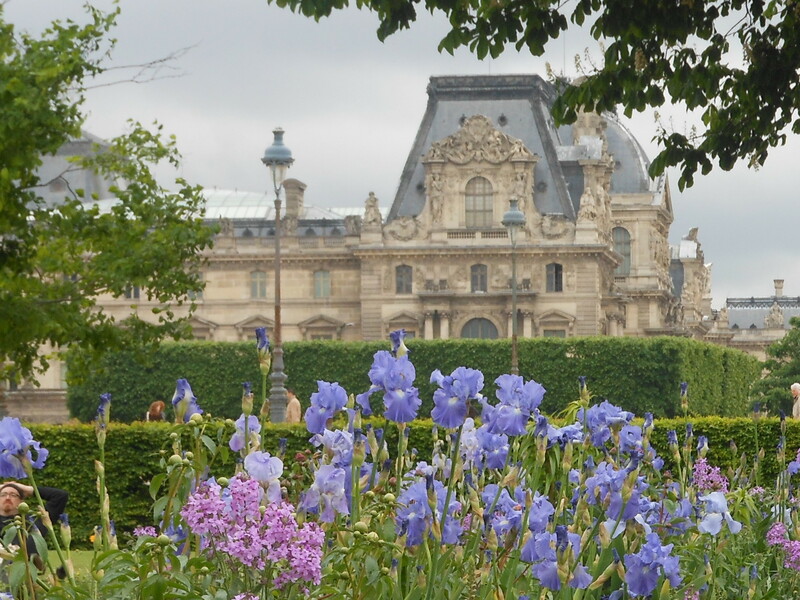 This entry was posted in France, Paris, Paris Museums, Paris Sights and tagged Chateaus near Versailles, Chateaux of Loire Valley, Crowds in Europe, French Revolution, Hall of Mirrors at Versailles, Louvre Museum, Mona Lisa, Palace of Versailles, Tuileries gardens on May 31, 2015 by Claudia Suzan Carley.